I’m a morning person who really enjoys breakfast, and when I have it I usually have it on the sweet side. Whether it’s pancakes with maple syrup, cereal with blueberries, or a strawberry smoothie, I love a fruity, flavorful morning meal. However, sometimes I like to change it up with something savory, like a vegetable frittata, sausage muffins, or these crispy scallion potato pancakes! These savory pancakes are so simple and quick, and they’re as delicious with a dollop of sour cream as they are with a plate of eggs and bacon. To serve four people, just peel and grate about four potatoes and mix with an egg white, scallions, salt and pepper. Place them in a hot pan with some oil, and press down firmly to get them golden brown and crispy. Once they’re done cooking, you can serve them as is or cut them into wedges for easy eating. These little hot cakes are so scrumptious with sour cream or, since they taste similar to hash browns, ketchup. Enjoy the rest of your quick morning breakfasts this week, but take the time to try these some slow weekend morning. You and whomever else is lucky enough to eat these with you will be very happy you made them! Peel potatoes and shred on the large holes of a box grater. Squeeze the shredded potatoes dry. In a large bowl, using 2 forks, mix the shredded potatoes with the scallions, egg white, salt and pepper. Set a 10-inch nonstick skillet over high heat. Add oil to skillet. Add the potato mixture to the skillets and press into firm cakes. Press the cakes firmly and cook until they are browned and crisp on the bottom, about 5 minutes per side. Slide the cakes onto a work surface. Cut into wedges and serve. These look so tasty! Potato pancaked make me so happy. Great recipe! I’m a sweet breakfast type of person most of the time but I would never turn down a crispy potato pancake! Those look lovely, Georgia! I’ve love potato pancakes. What’s silly is I’ve only had them at dinner time, never for breakfast! Ahhh, I’m going on week 2 of no carbs and these are definitely not helping! I make a similar pancake out of shredded zucchini but it doesn’t compare to the starchy goodness of potatoes. I’ll have to make these for my cheat day on Saturday :) As always, gorgeous photos! These look great. It is funny that you posted these because I also made some for the first time last week. I am a morning person too, but my breakfast is usually toast with tea. Those savoury scallion pancakes look wonderful. Georgia, these sound heavenly! I might make them for dinner and pair them with a salad. Yum! These look so good! I love how crispy they are. I too like a sweet breakfast and enjoy cereal with fruit or blueberry pancakes on the weekends. I love my sweet breakfasts too, but I want to try these. I know my bf would love them! 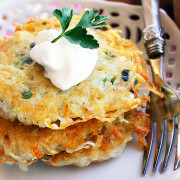 I love breakfast and these potato pancakes would make me so happy! These look SO good. Nice and light, but really tasty…you can just tell! Georgia-These look delicious!I never had them for breakfast. My mom makes delicious latkes…yours look fantastic!!!! My hubby and I could eat this for breakfast, lunch and dinner! These look so pretty and yummy! I like to have breakfast food for dinner and this would be perfect! The yellow makes me think of Spring! I’m a breakfast FANATIC. I usually dig stuff on the sweeter side too though, which probably isn’t a very good thing. These potato pancakes look great though, I bet they could convert me! Ooh ooh ooh! I always have leftover scallions, and besides a nice little garnish to have on hand, I am always looking for recipes that include it as a main part of the recipe. I will definitely be trying these. Thanks, Georgia! I love the rose, too. How beautiful. LOVE it! I promise I am coming back again and yet again!! These sound so addicting and perfect for any time of day :) Your photos are so gorgeous too! I’m looking forward to checking out your blog more! Georgia, these look delicious! I would love that savory start to my day. Beautiful potato cakes! YUM!!! Love them! Beautiful photos and the recipe looks a little different than mine, so I will definitely give it a whirl! Georgia…..You are a girl after my own heart!! These look great! I can’t wait to try the recipe! Very interesting Georgia. In Brazil we made this recipe too. Its a dish very delicious. Congratulations! The recipe clearly states to cook the potato pancakes 5 minutes per side. I use frozen hashbrowns. just thaw and work just as good less work. Easy simple and delicious recipe! Yet just one question, it’s hard to keep the potato in its original white creamy color, instead they all turned reddish after I scraped them into shreds, so they all turned out dark after I cooked them. What’s the trick to keep the potatoes look nice and white like the picture in the recipe…? Thank you!